What's for Lunch, Honey Bunch? For kids, the importance of a routine is colossal! Particularly for those who are still learning to tell time, it provides footing, it allows them to know what to expect and to anticipate. Routines ground the young, helping them to predict what will happen next. Despite inevitable opposition, children notice and respond well to an itinerary. I always try to cue in my daughter of the daily plan, if possible the evening before. If there is an after school activity she is never surprised, she knows the plan. Over time, I trust that this will help build her foundation -- into becoming solid, confident and secure. Routines are one of the many reasons it is great to be back to school -- to have structure, a schedule, a sense of time and place for everyone; it takes the guess work out of the week. I love it! While not everything goes smoothly, the routine helps our daughter feel that she is in the know. But, one routine that I struggle with, along with half the parents that I know, is developing sensible, interesting and edible lunches. It is a consistent parental topic at school drop off/pick-up -- "what do you put into your child's lunchbox?" I feel like I have tried everything, from letting her choose her items to putting fancy gourmand-worthy dishes in her box. Below are some suggestions (all are nut-free) that have worked in our family, and some are borrowed techniques from other frustrated parents. Remember don't overwhelm children with too many options. They do better with fewer choices and it can help limit the fussiness and waste. Soups tend to work well. But, it is important to consider "fragrance." While a simple chicken vegetable soup will not likely evoke comments from fellow classmates, anything with curry or even a lentil soup will. Children love carbs. Buy some quality cheese tortellini and boil in stock (chicken or vegetable, see previous post for recipe) in the morning before school. Add in peas during the last 2 minutes of cooking. Put this delicious treat in a small thermos. You can even put some in a larger thermos for your lunch! Another pasta idea: there are some easy to make boxed Mac and Cheese products that can be prepared in the morning and placed in a thermos. Amy's (brand) and Back to Nature (brand) have great organic products that our daughter frequently requests. These boxes are fairly inexpensive too! Hard boiled eggs are an excellent source of protein, but not that presentable. So cut them up with an egg slicer or make them into silly shapes. The entire PACKiT lunch box is put in the freezer overnight and the contents remain cold for many hours during the school day. While it is very popular (with millions in sales), I am not a fan. Frankly, I would rather have a lunch box that keeps food hot! Cut bread into interesting designs for sandwiches. And mix up the protein -- lately fresh mozzarella has been the cheese of choice in our house. After your children discover they don't like sandwiches any longer, simply deconstruct it by separating the bread from the protein. This also helps prevent the dreaded soggy bread syndrome. Also, try small pieces of meat, cheese, even beans, separate or mixed. Always include something you know your child enjoys. Our daughter fancies organic fruit gummies, or a nutritious granola bar. Stonyfield (brand) makes organic yogurt squeezers -- these always get eaten, and have lasted the test of time. Create a surprise container. Everyday, surprise your child with a treat. Newman's Own (brand) makes sensible snacks. Also Zen (brand) makes organic pudding made with almond milk. It's tempting, but don't do it!! There is little value added in putting junk food in the lunch. High calories are not the answer and high sugar will only result in sluggish behavior later in the day. If your child is reading, place a little note into the lunch box. Make sure this note refers to something in the lunchbox. For example: Guess what I packed in here today?? Enjoy! Love, Daddy! Our daughter has always had a taste for carrots and celery sticks in her lunch. But this does not seem to be the case for most kids. While raisons alone are a sensible lunch item, grated carrots mixed with raisons are even better. Rice balls -- simple, gluten free and delicious. Use leftover rice from dinner and shape it into balls. Kids love them! Pancake roll-ups filled with a favorite fruit also work well. Use the leftover pancakes that you cooked over the weekend. Sushi Rolls were a huge hit in our house for a while. Try Cucumber or Avocado Rolls, also smoked salmon with cream cheese was popular-- lots of protein too. Children adore rainbows. Organize the lunch box (and children can help with this) with the different ROY G BIV colors. You'll be surprised how well this works, especially for pre-schoolers. Jello is an age-old treat! And now there are some tasty organic varieties. Beverages -- water, water, water. We switched from juice to water early on by allowing our daughter to pick out her own water bottle. Now, she insists on using it. But, if possible, try to keep the beverage separate from the lunch box so they don't fill up on it, or encourage kids to eat a certain number of bites before taking a drink. 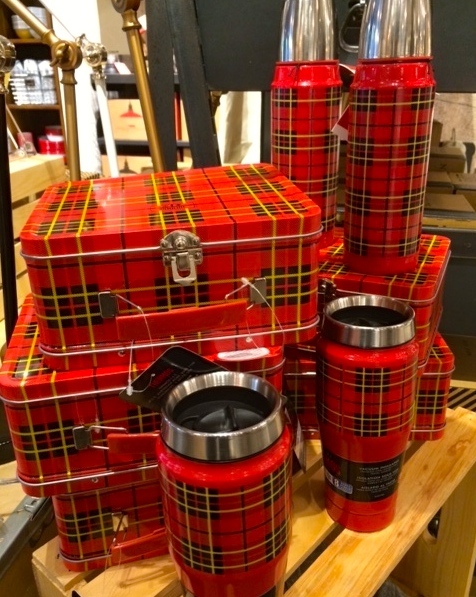 Wouldn't you say it's a fairly nice collection of lunch containers! We'll try anything! Be sure to include fruit everyday. Apple or peach slices are standardly well received by most kids, as are blueberries, grapes and strawberries. Avoid bananas, they tend to be malodorous and can overpower the container (and classroom). Don't be afraid to venture out with less traditional fruits, such as mango, guava or papaya. On Fridays, cut up a piece of pizza. It's simple and you know they will eat it! I would be happy to share some links here on more lunch box ideas, but there don't seem to be that many out there. So I hope this helped! In my family, as soon as we start to feel the September nip in the air we know the “carefree” days of summer have passed and the inner squirrel is soon to arrive. All those delicious fresh veggies are not going to be at farmer’s market much longer. It's time to look forward to the fall harvest: kale, collards, cabbage (ahh -- and my famous cabbage Ribbolita -- recipe soon to follow). Luckily, these autumn leafy favorites are high in antioxidants (cancer fighters) and have other significant health benefits, such as lowering cholesterol (see below). Mid-way between light summer fare and hearty winter stomach fillers are some amazing autumnal dishes. Further down is a delicious, and VERY simple bean and kale soup that everyone who tries seems to request the recipe. But, before we get to the soup, it is worthwhile discussing stocks. While there are some delicious store bought stocks (check out Rachel Ray's Chicken Stock), it is best to make your own, provided you have the time. They all start with the same base. Some call it the ”cooking trinity” - onions, celery and carrots. After chopping (they don't need to be diced) these veggies go into your largest pot heated with olive oil. Once softened, simply add in other chopped vegetables and common ingredients in the refrigerator: parsnips, turnips, garlic, parsley, dill, salt and pepper. You will enjoy how beautifully they mesh together in the pot. Avoid using tomatoes, broccoli or other ingredients which will overpower the subtleness of the stock. 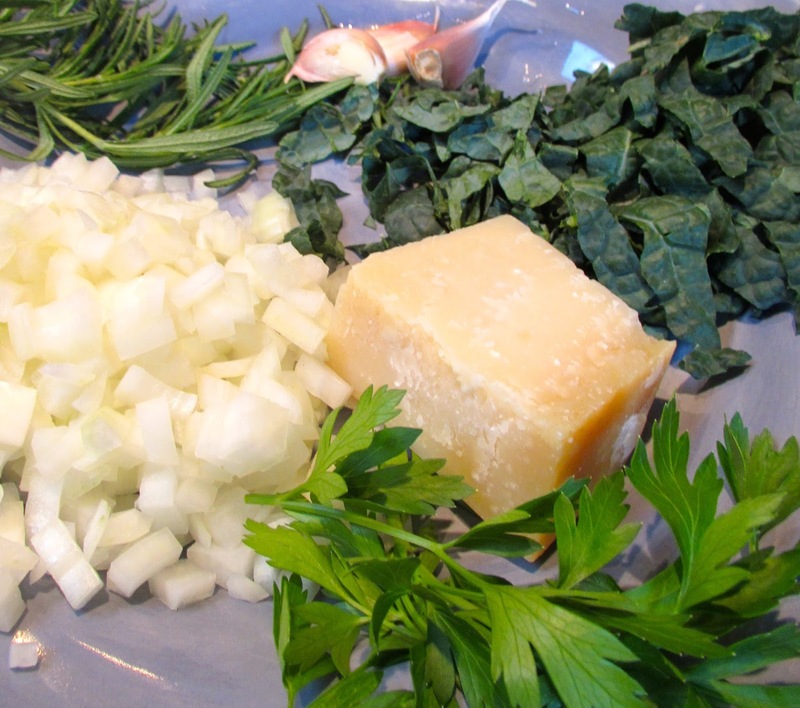 These can be added into the soups or bases of the dish that you make with the stock, but not here. I wish I could send over the smell -- it is culinary heaven. Once all the vegetables are soft, I add chicken bones (rotisserie leftovers) or a whole chicken. As Thanksgiving nears, I will ask the butcher for turkey necks, as they give the stock a heartier, complex, less common taste. It will be used for gravies and for basting. 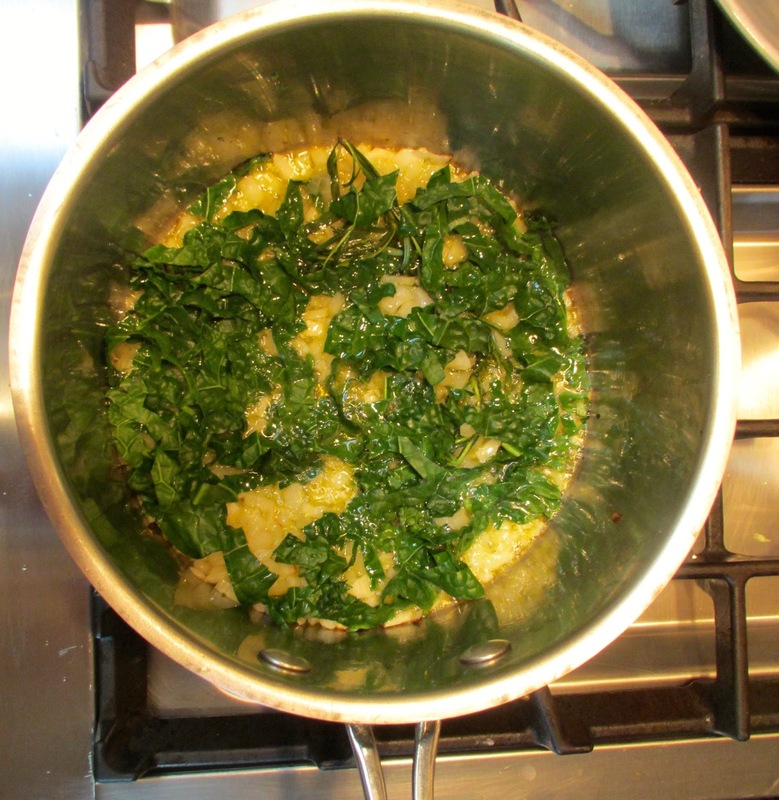 Kale and Bean Soup -- in only 15 minutes!! Chop kale, mince garlic and dice onion and shallot. Heat olive oil in large sauté or soup pan. Saute onion, shallot, garlic and whole stalk of rosemary for about 5 minutes. Add drained and rinsed beans and let simmer for 10-12 minutes on low heat. Double recipe if serving more than 2-3 people. Simply put, kale is one of the healthiest vegetables on the planet. It grows well organically, contains beta-carotene, lutein, calcium, potassium, iron, magnesium, and other minerals. It has high concentrations of Vitamin A, Vitamin C and most importantly Vitamin K -- a crucial antioxidant which helps reduce risks of most forms of cancer. Vitamin K is also abundant in parsley, spinach and collard greens. Aside from its antioxidant properties, Vitamin K is important for normal blood clotting and bone health, and is used in treatment for people with Alzheimers. Oh, by the way, cooked kale also helps to reduce cholesterol! Just eat your Kale, Dagnamit! 1. Get it up and out of the face! By now you have likely made your annual trip to your local box store to pick up your kid's school supplies. You probably have in mind what everyone will be wearing for their first day back to school. 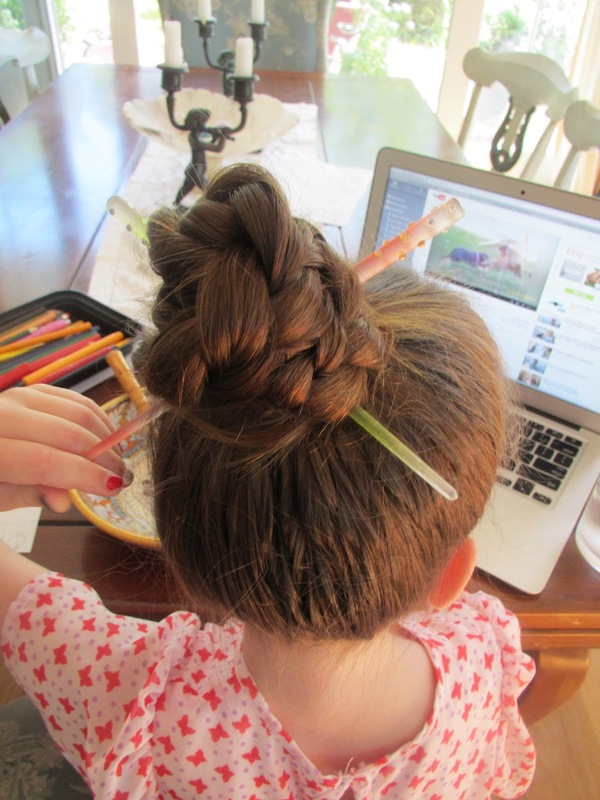 But have you thought about your daughter's first day of school hair design?? Braids are always stylish. And perhaps owing to the popular The Hunger Games and Game of Thrones series, even more so now than ever. They symbolize power and strength in women. Thankfully, they are easy and workable and have some range. 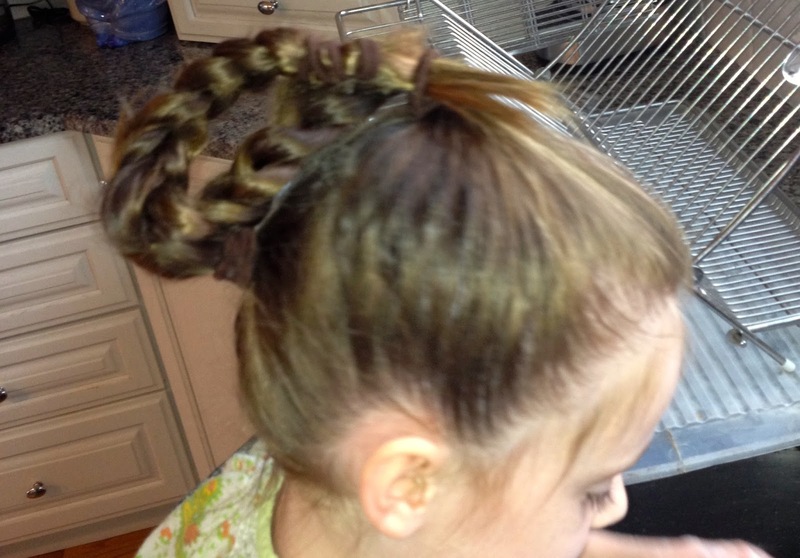 For my daughter, keeping hair out of the face all day while at school is a key consideration to any style. 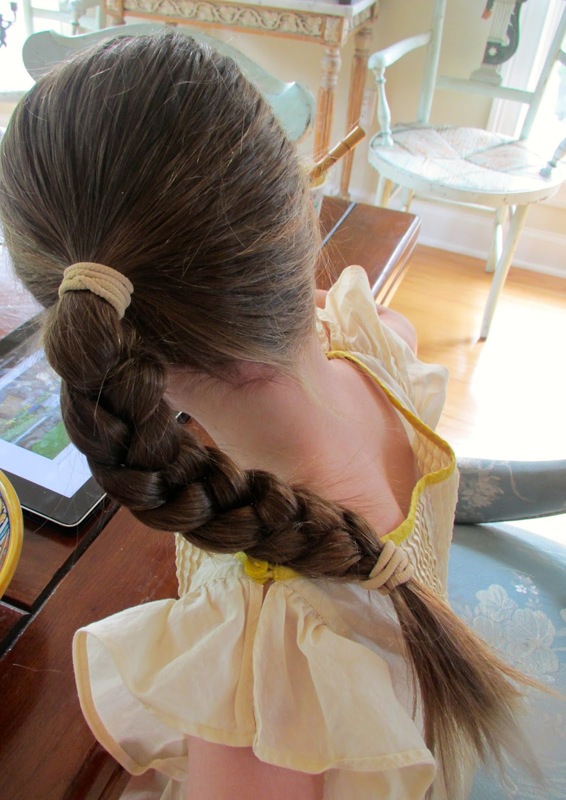 The above braid, which starts higher on the head, dutifully performs this task. 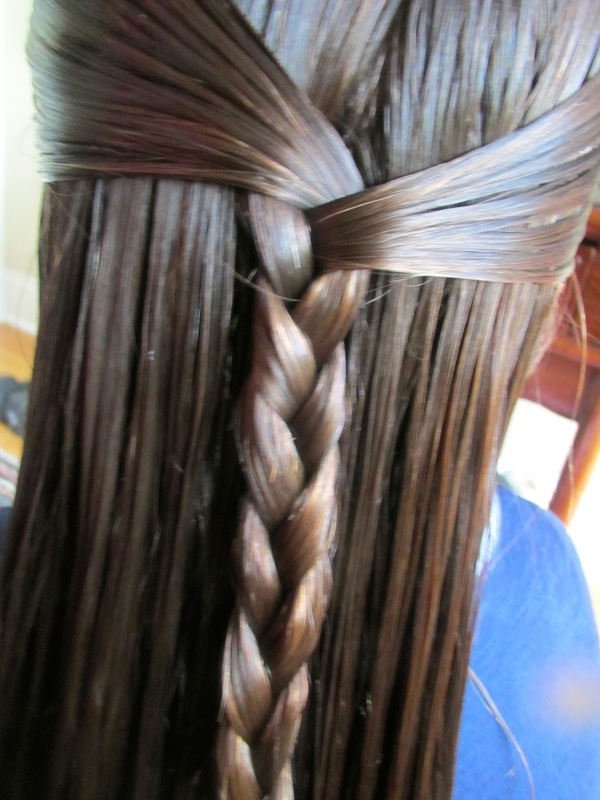 The sides braid is also effective in keeping the hair off the face, and adds a different twist (pun?) to a classic look. 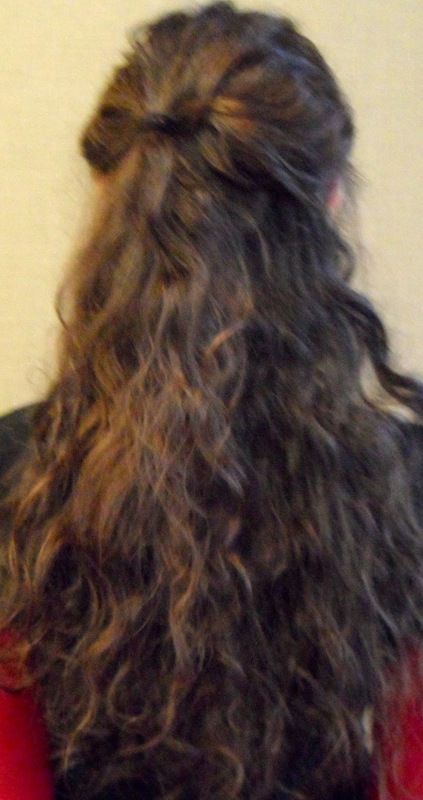 The "don't try this at home" braid -- 4 strands! It took numerous tries to get it right -- over under, under over. Charmsies bring the bling! 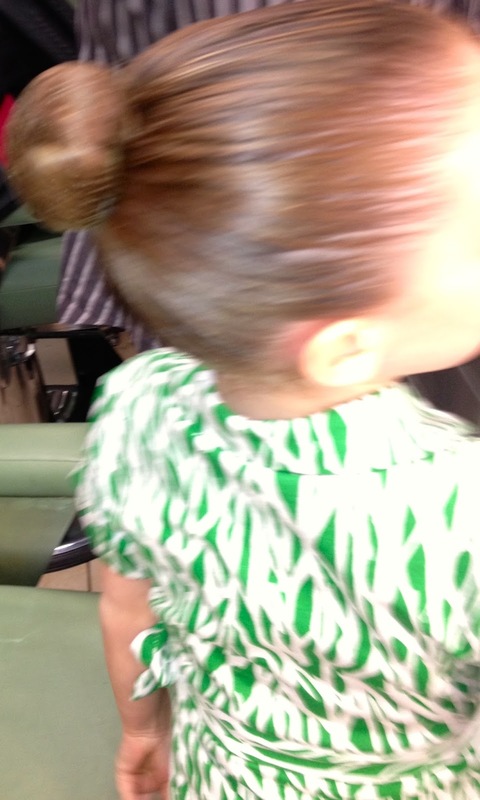 They simply adhere to the hair after quickly pressing for a few seconds with a flat iron. 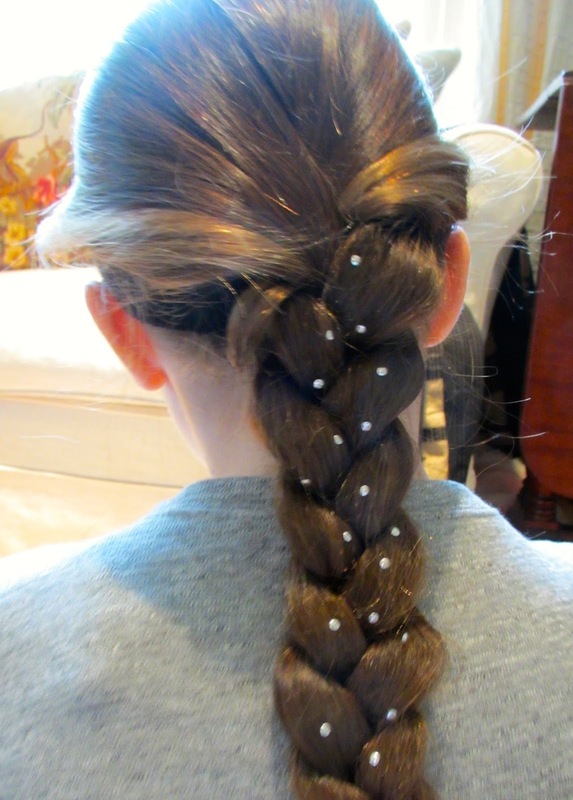 Every hair style looks a little better with some hair ornamentation. Go ahead, put that scarf in there! 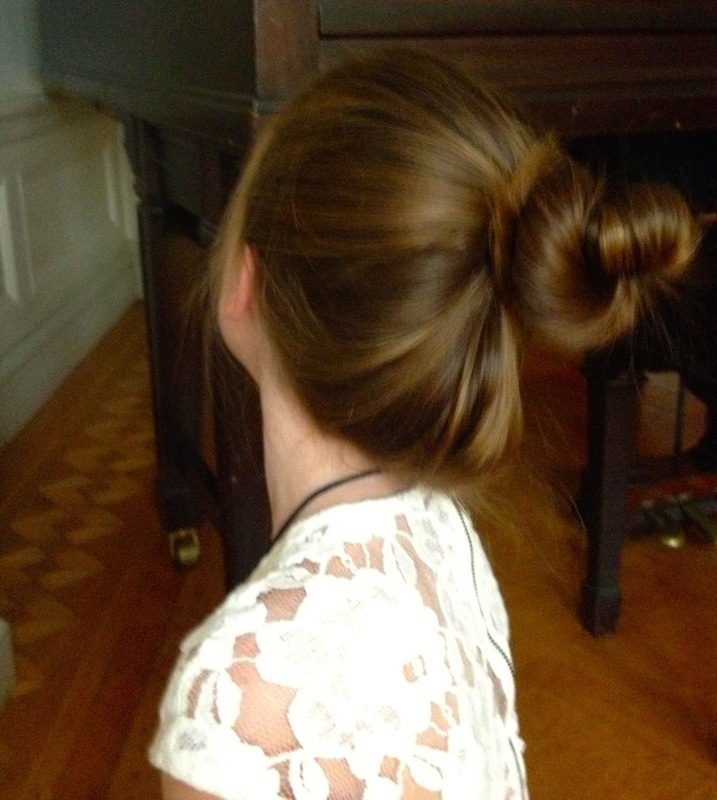 Keep the styles classic while you can -- soon enough you won't be making the hair decisions! 5. Be Creative - Mix it Up! 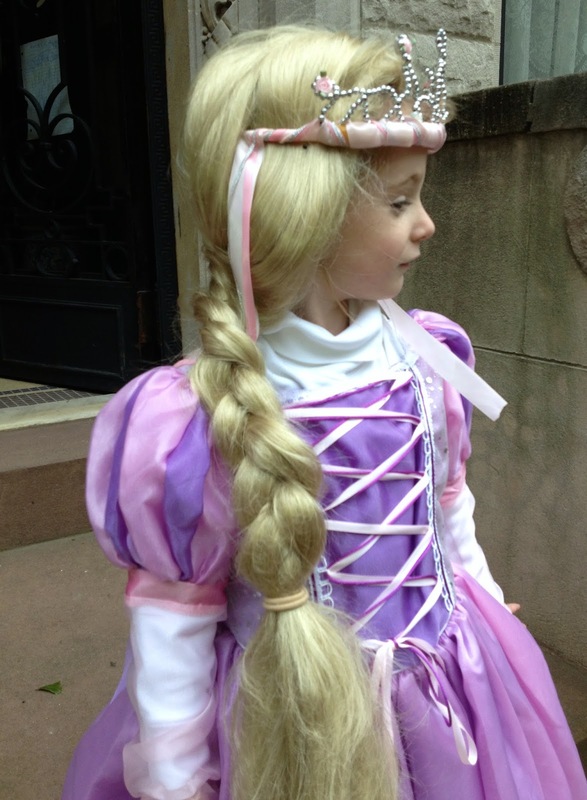 Sorry, I just had to add in the Elsa wig (from Frozen). 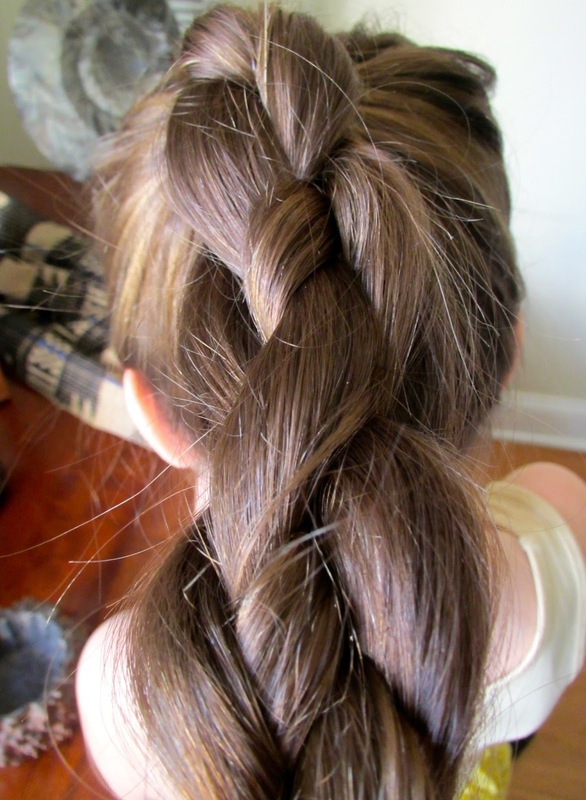 Another twist on the braid. Just flip it back up on top. ...or, the scary Halloween Bun! Colorful hair ties -- such a simple, delightful tool for adding color to any outfit. If placed correctly, these ties help evenly distribute hair tension, limiting breakage. I am a firm believer in using organic hair products on children whenever possible -- limiting exposure to questionable chemicals -- parabens, phthalates, petroleums, etc. -- is always a good idea. 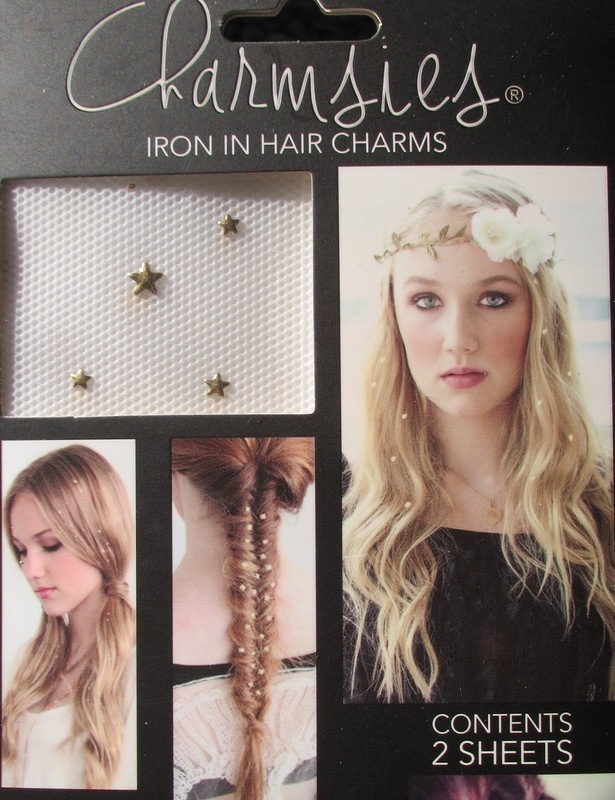 The trick is finding products that smooth away the tangles and leave the hair soft and shiny. I have been using the Burt's Bees line of products for our daughter since she was born. They are gentle on her hair and skin, and are made of all natural ingredients. I receive many compliments on her silky locks, and I attribute much of this to the faithful use of this product. Recently, I have been trying new products and, of the bunch, would strongly recommend the Aubrey line (conditioners, mostly). This product is high in vitamins and seems to restore moisture, boosting shine. I also like the John Master's organic product line, but they tend to be expensive. Also, any of the Argon Oil products give hair shine and leave it with a subtle scent that girls enjoy. If your child's hair seems beyond repair, try this truly organic (albeit crunchy granola) old-fashioned trick -- condition with a few tablespoons of mayonnaise. Seriously it works! 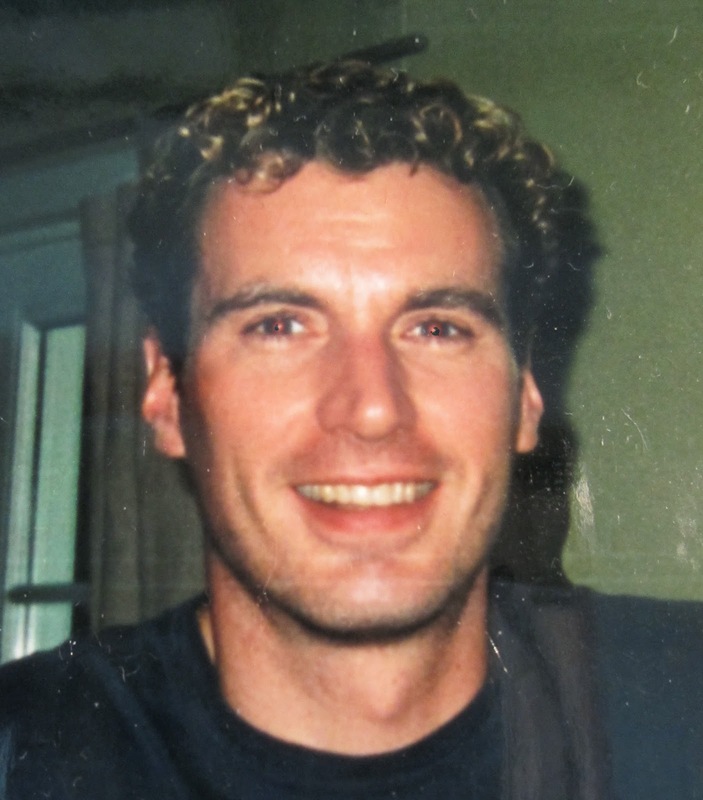 While unpleasant to discuss, my partner reminds me that many back-to-school editorials mention that autumn is the high season for unwanted hair pets (lice!!). Using conditioners is believed to have the added benefit of drowning these unsavory buggers. 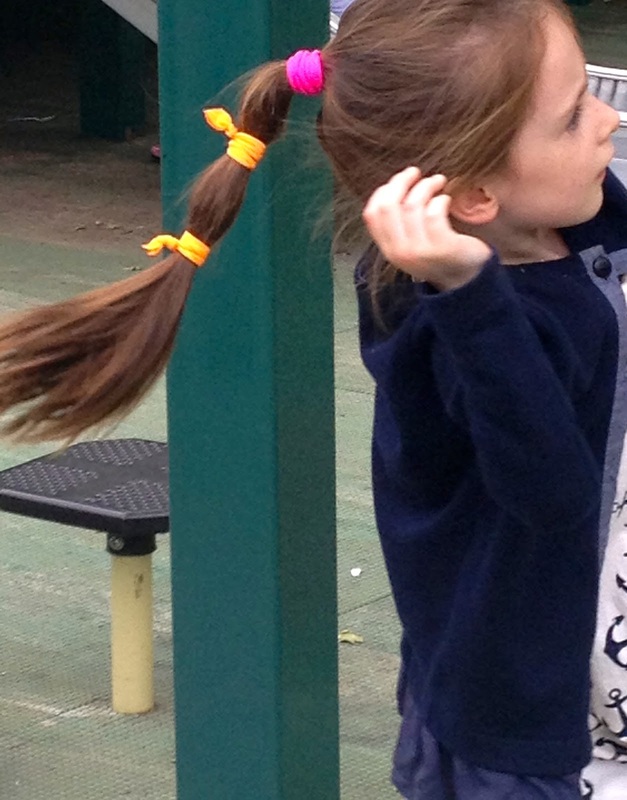 Raking through my daughter's hair causes comments of displeasure from her every day. After purchasing countless brushes, I am a true believer in the Mason Pearson brush, but it is expensive, very expensive! Luckily, Scalp Master knocks off this brush, and is an effective alternative. Throw away those wire tooth brushes, stick to the mixed bristle. If you have a boy, part the hair to the side or better yet, straight back, and you are done for the day!